Robert Herrick. The Lily in a Crystal. THE LILY IN A CRYSTAL. Titian. 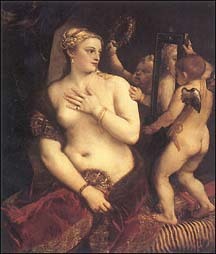 Venus at her Toilet. 1555. London, Lawrence & Bullen, 1891. 90-92. Created by Anniina Jokinen on May 12, 1999. Last updated on August 1, 2000.